A new film, the first documentary in English on Hokusai, brings the works of Japan's greatest artist to the big screen across the UK and Ireland on Sunday 4 June. Director Patricia Wheatley discusses Hokusai's lasting influence, and how 8K technology has provided greater insight into his immortal skill. In our new cinema broadcast, British Museum presents: Hokusai – in cinemas across the UK on Sunday 4 June – Tim Clark, Head of the Japanese Section at the British Museum, compares curating the exhibition Hokusai: beyond the Great Wave to climbing Mount Fuji: a long hard slog rewarded by sublime views at the end. I could say the same for the documentary we have just made on Hokusai, with hopefully the same results. I wanted to make a film about Hokusai because I think he’s the perfect subject to bring to our audiences. He’s an artist who has made works of art, including the iconic Great Wave and Red Fuji, that everyone recognises – and yet one who is still largely unknown in the UK. Surprisingly, this is the first UK film biography of him. Hokusai literally worked with the cutting-edge technology of his time, designing exquisite woodblock prints that were a mass-market success. ‘The Great Wave’ ran to an edition of thousands and you could own a print for the same price as a double portion of noodles. Filming in Tokyo this spring, what struck me was the link between the technology of Hokusai’s time, 200 years ago, and that of today, a very Japanese success story. 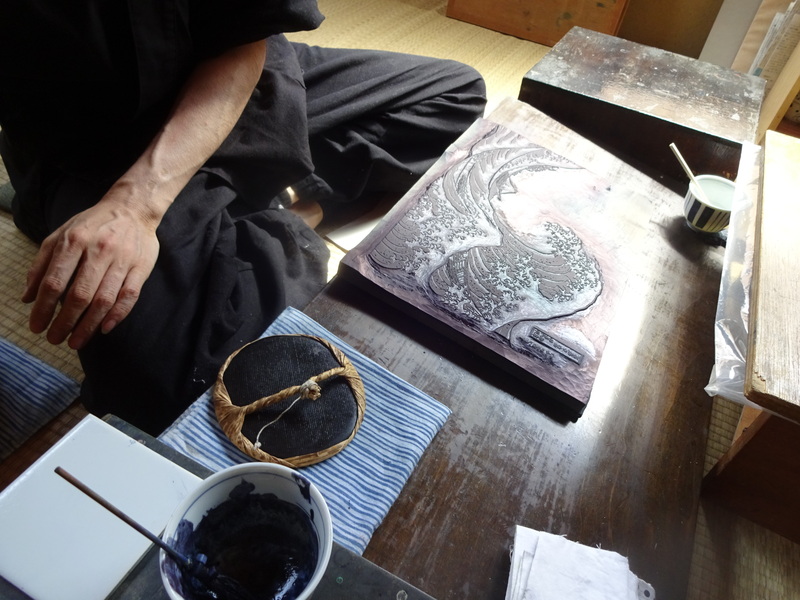 Okada Takuya in the Takahashi studio recreating Hokusai’s Great Wave. I wanted to show the skill and artistry that went into producing Hokusai’s prints as well as their widespread influence today. At the Takahashi studio in Tokyo we filmed master block cutter Asaka Motoharu and printer Okada Takuya recreating Hokusai’s Great Wave, sticking an outline drawing on to a cherry woodblock, meticulously reproducing the ink strokes of the drawing with the finest cutting tools and applying the pigments to produce a vivid replica of Hokusai’s iconic design. We argue in our film that Hokusai was the father of the manga comics and anime films that dominate Japanese popular culture. Manga literally means ‘random pictures’ and Hokusai’s original manga were a series of drawing manuals. Uragami Mitsuru has been collecting Hokusai’s manga for almost 50 years and now owns 1,500 volumes. We filmed him at the Toppan printing company where Uragami’s collection has been digitised, to share the incredible richness of Hokusai’s imaginative invention and pictorial universe. Watching his creatures and characters dancing on the screen was a mesmerising experience. Katsushika Hokusai (1760–1849). Kohada Koheiji. Colour woodblock, published by Tsuruya Kiemon, c. 1833. 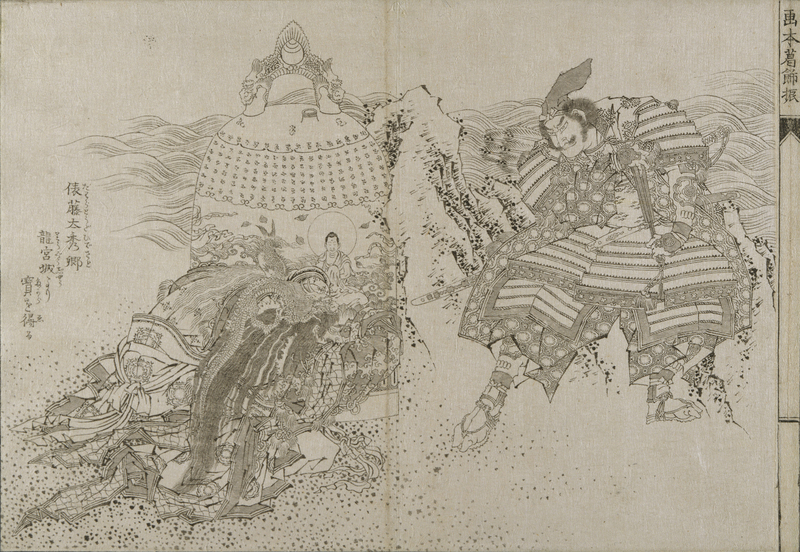 Hokusai’s parentage of the manga and anime genres also derives from his great success as an illustrator of popular adventure novels in which, then as now, superheroes and samurai warriors battled mythical monsters and demons. One of my favourite locations was the Oyha Shobo bookshop in the heart of Tokyo, a wondrous Aladdin’s cave of antique books and prints, where you can still buy these volumes and copies of Hokusai pictures. A block-ready drawing inscribed ‘Strongman hero Benkei steals the bell’ from Picture Book: Japan and China in the Katsushika Style (Ehon Wakan Katsushika-buri) (c. 1836) by Katsushika Hokusai (1760–1849). © The Metropolitan Museum of Art/Scala. We were very fortunate that our partners at the Japanese state broadcaster NHK were keen to try out their prototype 8K video technology to support the British Museum’s research project on Hokusai’s work. 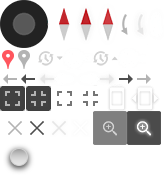 This pioneering technology is by some magnitude the highest resolution image so far achieved, providing extraordinary high definition close-ups. A large team of expert technicians brought their equipment from Japan and installed it in the Museum, filming with a surgical precision some of Hokusai’s most celebrated prints and the remarkable painted scrolls that were his last works and the ultimate expression of his genius. The unprecedented level of close-up detail and clarity revealed secrets of Hokusai’s technique that astounded Tim and fellow Hokusai scholar Roger Keyes. I like to think it was this meeting of ultra-hi-tech and Hokusai’s Japanese graphic elegance that appealed to David Hockney when he agreed to an interview for the documentary. Hockney is a lifelong Hokusai fan. Speaking as a mere 80-year-old to Hokusai’s 90, he shares the great artist’s absolute commitment to his art and I’m sure Hokusai would have exploited and revelled in today’s 21st-century technologies just as Hockney has done. You can see many of Hokusai’s beautiful works made in the last 30 years of his life in the exhibition Hokusai: beyond the Great Wave, on display at the Museum from 25 May to 13 August 2017 (closed 3–6 July), supported by Mitsubishi Corporation. 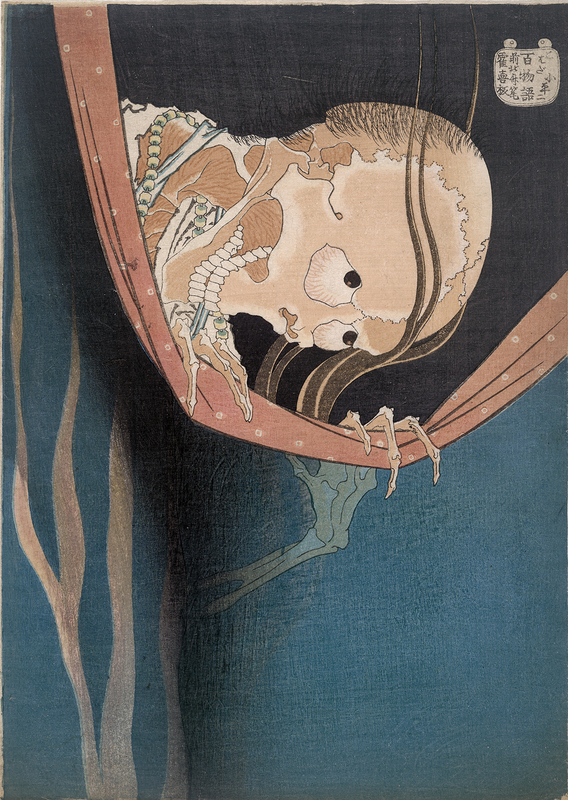 British Museum presents: Hokusai is coming to a cinema near you. Find your nearest venue. Tickets are bookable through cinemas. Distribution partner More2Screen. Co-produced by NHK.